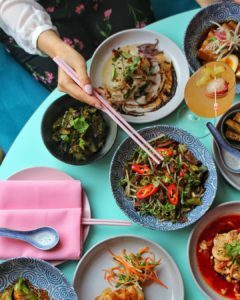 The mouthwatering plates served up at this hip west-end joint are beyond SoSo, they are a stellar modern interpretation of the classic Chinese cooking that the owners grew up with-but turned on its head. Not adhering to any one region of China the menu at SoSo Food Club flexes its might in every dish. Flavours are both familiar and new which easily win over taste buds and minds alike (Pro tip: aim straight for the dumplings first and just don’t stop). Communal sharing recommended to let you have a bit of everything, pay special attention to A focused and unique drinks list has everyone satisfied from crafter cocktails, unique beer and wine list and even mocktails for those who need a break from it all. 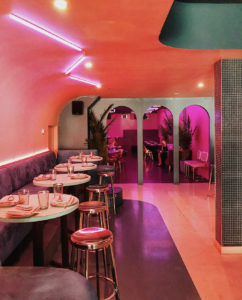 Entering SoSo is like stepping into another world, and the design pulled heavily from Hong Kong and even future-past looking Korean restaurants. SoSo takes it one step further featuring cooking and tasting events. Also known to turn into a little hit spot to let loose and dance after 11 to an ever-rotating bevy of DJs and genres.